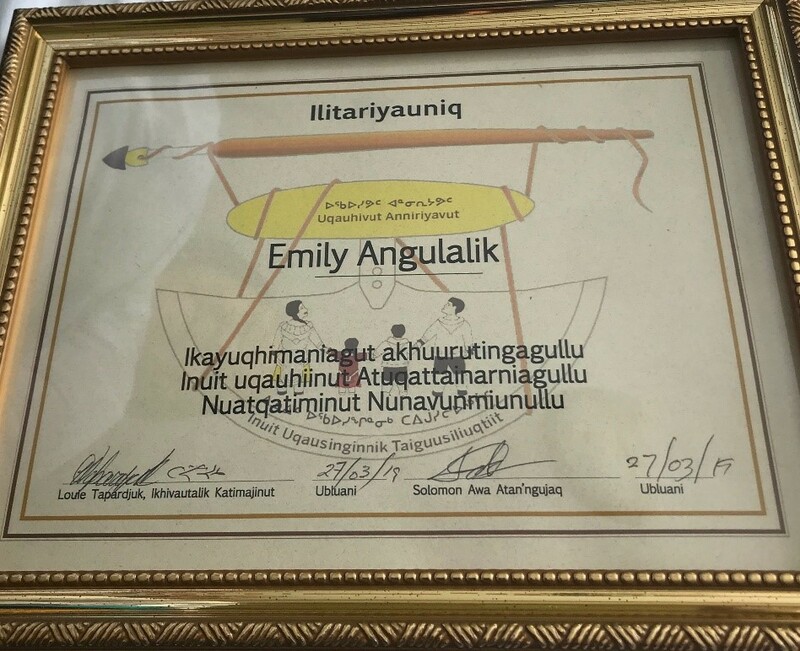 Last week, Emily Angulalik, instructor at Nunavut Arctic College received an Award at the Language and Culture conference in Iqaluit for her contribution and promotion of Inuit Languages to her fellow Nunavummiut. Emily is originally from a tiny outpost camp on the Queen Maud Gulf, called Perry River which is 109 Southwest of Cambridge Bay. She has been working at NAC since October 2013, and has delivered the Language Revitalization Program in partnership with University of Victoria since 2016. Emily is determined to promote and preserve Inuinnaqtun. She believes that the sharing of the Inuinnaqtun language is declining, and the number of elders, who are the knowledge keepers, is also declining. This motivates her to keep the language alive! We are proud to have dedicated instructors who are committed to keep Inuit culture and languages alive. Congratulations Emily, from all of us at NAC.